Was a 'Friends' Star 'Caught' Red-Handed for Theft in England? 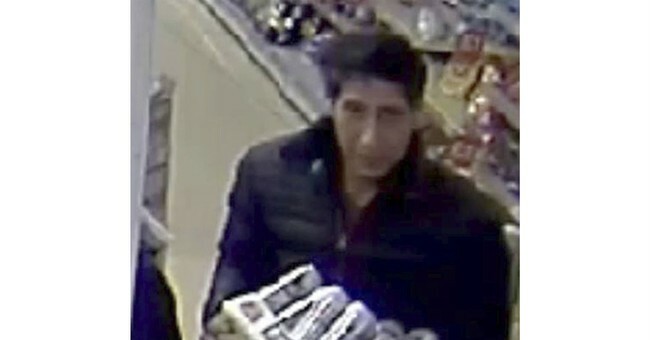 "Friends" star David Schwimmer has plunged so far from the Hollywood spotlight that he was caught on camera clutching a case of beer while leaving a restaurant in Blackpool, England after stealing a few other items. It turns out "Ross" has a criminal doppelganger across the pond. The man, who bears an uncanny resemblance to Schwimmer, is wanted for stealing a jacket, mobile phone and wallet. The Lancashire Police, who said they had identified the actual suspect, were on fire with their "Friends" puns. The comments were as amusing as the mixup itself. “I don't think it's been this guy's day, his week, his month or even his year,” one person wrote. “I'm surprised you've not found him...it's like you're always stuck in second gear,” another commenter wrote. Schwimmer was self-effacing enough to poke some fun at the mixup. I mean, Schwimmer wouldn't have been the first celebrity to get in trouble for shoplifting. Who can forget Winona Ryder's $5,500 haul from Saks Fifth Avenue in Beverly Hills.